At the Summer Fancy Food Show one of the products most frequently featured in Mediterranean country stands was Extra Virgin Olive Oil. Olive oil, from different varieties of olive trees, is one of the products that have been produced and traded around the Mediterranean since time immemorial. The economy of large areas of the ancient world was based on the production and trade in olive oil; five thousand years ago there was a lively trade of preserved olives and oil between Pharaonic Egypt and the Minoan civilization of Crete. Archeologists still find large oil jars in practically every excavation of the ancient mercantile centers. Oil and wine containing amphorae are found in the wrecks of many merchant ships along the Mediterranean coastline. Olive oil was used in practically every ancient kitchen as condiment but also as medicine, for cleansing and as a cosmetic. A very common use in antiquity was by athletes during competitions to make the body sleek so that an opponent could not easily get a grip, as well as by soldiers during war for the same reason. Nowadays, high quality extra virgin olive oil is used mostly in the kitchen; a very small quantity of lower quality (virgin or pomace) is used in producing soap (green Marseille soap) and a few other uses. Producers usually create monovarietal olive oils from trees that have adapted to the local environment so well that even oil from the same varieties taste differently as the cultivation location changes. There are hundreds of olive tree varieties growing around the Mediterranean basin as well as other areas where the general climate resembles that of the Mediterranean. Olive oil is vulnerable to age and oxidation and the decay will start the moment the olives are pressed if the oil is not kept away from air, light and extreme temperature changes. The oil will retain the best aromas, taste and acidity if kept in closed, dark containers -- either glass or tin. The best oils are produced from olives that have not reached full ripeness and visually are still a little green; the resulting oil is always fruity, slightly bitter and spicy. The lower an oil’s acidity, the more prized it is. To be classified as the highest grade, extra-virgin, the oil’s natural acidity must be 1 percent or less. The best extra virgin olive oils have nice aromatic properties. Aromas such as apple, almond, freshly cut grass, or artichoke indicate freshness as well as quality. If the oil smells or tastes vinegary or rancid, moldy or like hay, the olives have been pressed after they have fallen to uncovered ground (when harvesting, cloth sheets are usually deployed around the trees) instead of being harvested while still on the tree or pressing happened too long after the fruit has been harvested and the fruit has started fermenting during transportation. The life of a good extra virgin olive oil is about two or three years maximum from pressing, when properly stored. In the kitchen, keep olive oil in a dark place, away from the heat of the burners or oven but do NOT refrigerate it, as low temperatures are as injurious to the sensory quality of the olive oil as high ones. 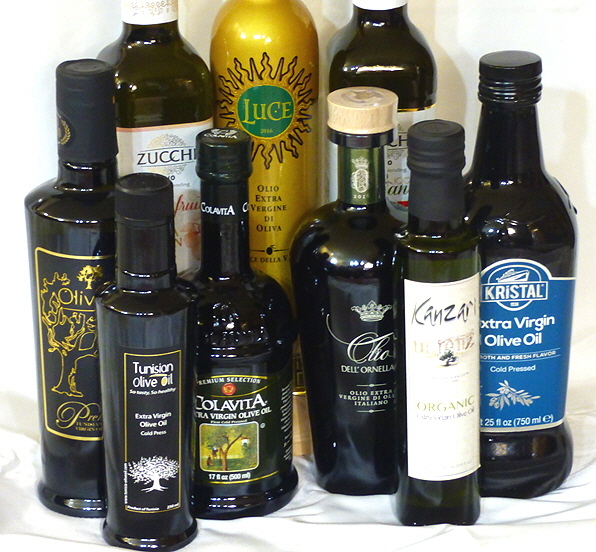 As I mentioned, there were numerous excellent extra virgin olive oils featured in the show. I was lucky enough to be offered samples of EVOOs from Turkey, Tunisia, Spain, Italy, Greece and Morocco. All were from pressings of individual varieties indigenous to the countries of origin like Arbequina, Arbosana, Picual and Hojiblanca from Spain; Amphisa, Koroneiki and Kalamata from Greece; Ayvalik, Izmir Sofralik and Domat from Turkey; Ascolano, Cerignola, Coratina, Frantoio and Leccino from Italy; and North African Chemlali, Picholine Marocaine, Meslalla and Gerboui. Kristal, cold pressed Sofralik, from Turkey’s North Aegean coast. Olio dell’ Ornellaia, from olive groves surrounding the Ornellaia vineyards in Bolgeri, in North Western Tuscany. Olivko, a premium cold pressed Picholine Tunisian oil from hand-picked fruit. Kanzari, an organic extra virgin olive oil from Zaghouan, Tunisia. Luce, Olio Extra Vergine do Oliva, from Tuscany’s Luce della Vite. The above are available in mostly specialty stores such as Dean & Deluca, or ethnic outlets, or are sold directly through the internet. An EVOO that is very widely available in supermarkets and such giant sales outlets as Walmart and Amazon is the Colavita EVOO. The company was founded in Italy’s Sant’Elia in Pianisi, Molise, in 1938 and now has numerous plants around the country pressing olive fruit into oil, plus they purchase EVOO from other high-quality producing countries. Since the sourcing is so diverse, much of the the Colavita EVOO sold in the US is a blend -- the bottle shown above blends Italian, Greek, Portuguese and Spanish oils -- but the organoleptic characteristics are such that I would safely place it in the better oils category. Also, very notable were the oil samples I received from another Italian blending company, Oleificio Zucchi. Oleificio Zucchi, creates exceptional kitchen olive oils by purchasing very high quality product from producers around the Mediterranean and as far away as California and Argentina and blending them to achieve specific results. The final product retains the best characteristics of EVOO minimizing some undesirable nuances of individual varieties. The subjective judgments of the company’s Blendmasters create extraordinary results that would tempt the palate of any gastronome.